Here’s a bit of a different type of article. With all the money you save through money saving tips you learn from this blog 🙂 you should be saving more in retirement. Here’s a quick run down on how a Roth IRA works. In 2013, you are allowed to contribute up to $5,500 to your Roth IRA if you are under the age of 50 and $6,500 if you are over the age of 50. The good news is that you only have to be 50 or older for one day during the past year. For example, if you turned 50 on Christmas day, you can contribute an extra $1,000 for 2013. The IRS permits you to have multiple IRAs as long as you do not contribute more than your yearly limit. Workers who make over $112,000 will see their ability to contribute to a Roth IRA slowly phased out. If you make over $127,000, you may not be able to make any contributions to your IRA at all. Married couples will there IRA contributions phased out after $187,000 of combined income. You should work with a financial adviser to determine if you are eligible to make a contribution based on your income. Anyone who is self-employed can make contributions to an IRA as well. If you are self-employed, you are held to the same rules as those who are employed by someone else. Additionally, you are only allowed to contribute earned income to your IRA. Therefore, if you take distributions from your business as you main source of income, you may not be able to fully fund your IRA each year. If you have a Traditional IRA or a 401k, you can convert that into a Roth IRA. The best part is that there are no income restrictions on those who are want to pursue this route. 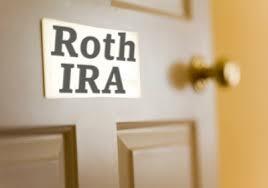 Therefore, it may be a good way to contribute to your Roth IRA if you may not be otherwise eligible to do so. One of the best reasons to contribute to your IRA is because the contribution can be deducted from your taxes. You have until the day you file your taxes in 2013 tax return to make a tax-deductible contribution to your IRA. In other words, you have until April 2014 to take a deduction on your 2013 taxes. If you file an extension, you have until October 2014 to make a contribution to lower your tax bill for 2013. However, you must establish your IRA before the end of 2013.